Into this sparsely settled land came 104 hardy, determined English Colonists on May 13, 1607. They built a fort and small settlement, and farmed and traded with the Powhatans, who were friendly at the start. Soon the English established other settlements on the peninsula, with James Towne as the administrative center or capitol. On July 30, 1619, in Jamestown’s Church, burgesses elected from each settlement in the colony formed the New World’s first representative assembly. In August, a Dutch ship brought the first blacks to the colony. Virginia was divided into eight shires or counties in 1634. James City included what is now Surry County across the James River, part of Charles City County, and some of New Kent County. By the early 1640’s, English settlers began spreading up and down the county, establishing generally modest farms and small plantations. Most contained about 250 acres, although places like Carter’s Grove and Kingsmill, which came along later, often had more than 1,000 acres. In working small and middle-sized tracts, the early colonists foretold the upper James City County farms of today. The chief crop, tobacco, became the cornerstone of Virginia’s economy for 200 years. Fire destroyed the colony’s fourth statehouse in October 1698. As Jamestown never had recovered from Bacon’s Rebellion, Governor Francis Nicholson and the General Assembly decided to move the seat of government to Middle Plantation halfway across the peninsula. In 1699 the newly established city of Williamsburg, named for King William III, became the capital. Still, James City County continued to thrive as Williamsburg grew in economic, political, and social importance. Richmond became Virginia’s capital in 1780. During the American Revolution, James City County, Williamsburg, and Yorktown were the scene of many significant events. In 1775 at Burwell’s Ferry at Kingsmill, scuffles broke out between local citizens and men from nearby British ships. The locals met in upper James City County, where they decided to assert their rights. On May 15, 1776, the Virginia Convention, meeting in Williamsburg, voted unanimously for independence from Great Britain. The Chickahominy Shipyard was established a year later in James City County to build Virginia’s navy, but was burned by British troops in April 1781. In September and October, British, American, and French troops roamed the area prior to the siege of Yorktown and the surrender of Lord Cornwallis. The French camped at several sites along Route 60. The removal of the state capital and all related government business to Richmond in 1780 had a lasting affect on the city and County, drastically shrinking the area’s economy and political influence. Continuous crops of tobacco depleted the County’s land, and other areas became the primary producers. By 1800, corn, wheat and potatoes were the County’s chief crops. The economy remained depressed until the 1840s, when scientific farming renewed depleted soil nutrients with marl and fertilizer. A growing steamboat trade on the James and Chickahominy Rivers also stimulated a recovery. Soon, the Civil War plunged the area into hard times once again. For most of the war, Williamsburg was held by the Union troops, following the Battle of Williamsburg on May 5, 1862. Rural James City County became a combat zone, raided at will by troops of both armies. In 1865, a disastrous loss occurred when James City County’s court records, stored in Richmond for safekeeping, were destroyed by fire. After the war, rebuilding was difficult for the survivors, both black and white. The local economy lay in ruins and hundreds of newly freed slaves sought a means of earning a living. In 1907, the nation observed the 300th anniversary of the settlers’ landing at Jamestown. A great celebration took place, principally at the site where the Norfolk Naval Base is now situated. It featured elaborate exhibits and an armada of ships. A hard-surfaced road was built linking Williamsburg and Jamestown for those who wished to see the actual settlement site. World War I brought the twentieth century to James City County’s doorstep. The peninsula became a center for troop training and embarkation, munitions manufacturing, and supply storage. Neighboring York County became the site of Penniman, a quickly built munitions town of 15,000 inhabitants that is now only a memory. Williamsburg was the base of supplies and rail center for the new town, and James City County was called upon in many ways to provide food, services, and wartime housing. By the 1920s, automobile travel had begun to revolutionize the economy. When work was initiated to restore the old capital of Williamsburg, thousands came to see the surviving eighteenth-century buildings and reconstructions of other major governmental properties. The restoration work was a vital factor in minimizing the effect of the 1930’s depression, help­ing spur the local economy until the beginning of World War II. James City County’s most important treasure was Jamestown Island, the scene of periodic commemorative celebrations beginning in 1807. It was saved from both desecration and commercialization by the Association for the Preservation of Virginia Antiquities (APVA), which in 1893 acquired 22-1/2 acres around the church site. Since the National Park Service came on the scene in 1934, the two organizations have worked together to protect and develop the island as an important historical site. A scenic parkway was planned to link Jamestown, Williamsburg and Yorktown. Only the Yorktown-Williamsburg section had been completed when the needs of World War II halted construction. A unique and now famous County business, the Williamsburg Pottery, had its beginnings in 1938. In a shed on a half-acre lot beside Route 60, Jimmy Maloney and his potter’s wheel opened what has become a multi­million dollar business, serving three million customers annually in 30 buildings on 200 acres. During World War II, industrial activity added to the County’s agricultural economy. Families of military and civilian workers moved to the area to be near their loved ones. Grove community was settled by Black Americans when the Naval Weapons Station and Camp Peary needed the property on which their homes were located. After the war, many military and civilian families remained, making their permanent homes in Grove. By the 1950s the economy was growing away from its agricultural heritage and toward manufacturing and service-oriented businesses. The College of William and Mary, long an academic and cultural pillar and leader of the area’s economy, contributed further to County growth. Student enrollment more than doubled from 1955 to 1970, leading faculty, administrators, and students to seek new housing areas beyond the city limits. 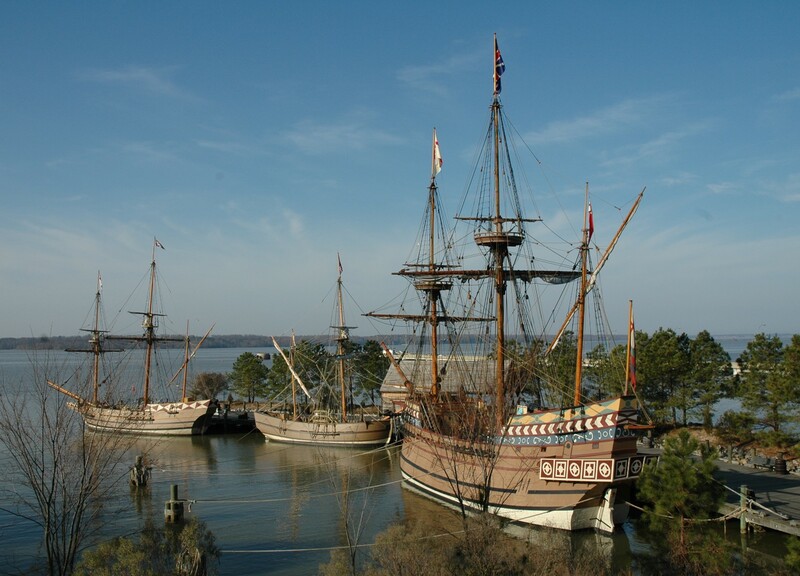 The year 1957 was the 350th anniversary of the arrival of the Jamestown Settlers in 1607, and it marked a dramatic increase in travel to the area. The Commonwealth of Virginia created Jamestown Festival Park to commemorate the event. This park continues as a vital factor in the area’s travel industry under its new name, Jamestown Settlement. Colonial Williamsburg opened a new visitor center, as well as hotel and meal facilities to assist in accommodating and orienting the steadily increasing number of visitors to Virginia’s Historic Triangle, the area consisting of Jamestown, Yorktown, and Williamsburg. The Colonial Parkway was completed, linking these three historical places by a limited access, landscaped byway. Carter’s Grove, an eighteenth-century landmark on the James River eight miles east of Williamsburg, opened to the public in 1964. A new surge of tourism was brought to the County by travelers visiting the mansion and grounds. A new era began for the County in 1969 when Anheuser-Busch, Inc., purchased the eighteenth-century Kingsmill Plantation. A major brewing plant opened, attracting support industries–Ball Metal Container Group, Owens-Brockway Glass, and Reynolds Aluminum Recycling. The first lots of the Kingsmill planned community were offered as quality home-sites. Busch Gardens/The Old Country opened in 1975 as a major entertainment park with a European theme. It has experienced steady growth.